One change for Wanderers from the side that had beaten Rochdale the previous Tuesday at Adams Park. Dominic Gape returned on the bench following his one match suspension. Walsall gave a debut to former Wanderer, Russell Martin, after the now 32 year old had joined The Saddlers as player/coach earlier in October. Martin made more than 100 appearances for Wanderers during a four year period before leaving for Peterborough United in May 2008. He later went on to make over 300 appearances for Norwich City and gain 29 international caps with Scotland. He was released by Norwich at the end of the 2017/18 season. "Just after [Paris Cowan-Hall] hit the woodwork it was very frustrating to concede, and from a set-play as well. It is something we work hard on. We told the boys they have great delivery into the box and they are a big side and that means don't give set-plays away in dangerous areas. We have given them one and they didn't disappoint with result so it was a tough one to take. "At half-time I wasn't too concerned, I was calm and I was saying to the boys we are always in games. The frustrating one was the third goal going in as that took us two goals away with 10 minutes to go but that is the way football goes sometimes." "[Alex Samuel] was brilliant when he came on and I am really pleased for him. Hopefully we can get him more involved as he is really champing at the bit at the moment. When you have someone like that, who is so hungry, it is fantastic to see." 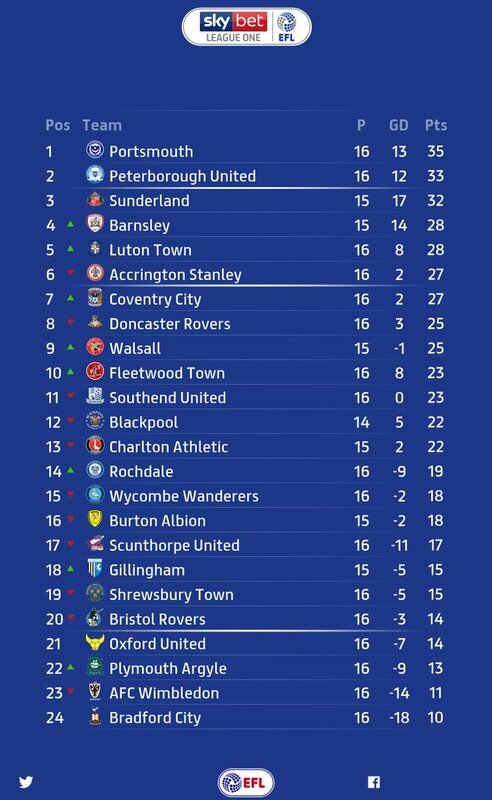 Wanderers dropped a place to 15th in the League One table following the defeat at Walsall, having taken 18 points from their opening 16 games. Bradford remain bottom of the table with 10 points, while Wimbledon drop to one off the foot following a sixth straight defeat. Wycombe host 2nd placed Peterborough United on Saturday 3rd November. Posh's away record in League One is the best in the division with 7 wins and 1 draw from 8 games. Also interesting to note that the three other promoted sides from League Two; Luton Town, Accrington Stanley and Coventry City are placed 5th, 6th and 7th respectively in the table.